Just as John predicted, now that Scott Brown has won the MA special election, we will be subject to a relentless barrage of explanations as to how the US political wold has been turned upside down in a matter of days. 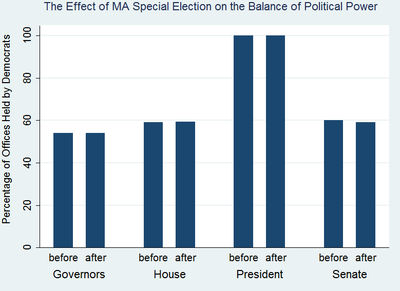 As a public service announcement, therefore, we at the Monkey Cage once again won’t try to interpret what the election means, but instead bring you the following graph that displays the actual effect of the MA Senate election on the balance of power between the two political parties in Washington and across the nation’s statehouses. Yes, the Democrats’ have lost their filibuster proof majority in the Senate. * And yes, I’m aware of the fact that there could be a ripple effect whereby more moderate Dems move to the right out of fear of losing the next election. But as to the actual balance of power in Washington today, the graph tells the story. The 1993 Canadian Elections this was not. Losing the filibuster-proof majority is sure to be a major blow to the Democrats because they previously had been able to move so swiftly on so much legislation because the caucus was such a powerful, unified bloc. Or, alternatively, it means that now the Democrats need to make sure that in a given piece of legislation that at least three of Olympia Snowe, Susan Collins. Ben Nelson, and Joe Lieberman are on board, as opposed to previously when you only needed two of these four on board. More technically, the pivot point in the Senate has probably moved from Nelson/Lieberman to Snowe/Collins, which is probably not that big a gap. Surely there are strong electoral incentives for the GOP NOT to cooperate with Dems (and thus not to provide the 60th vote), even controlling for their policy views. And aren’t those incentives to disagree made stronger last night with Brown’s win? I also have to disagree. A lot of Dems today are coming to the realization that the unemployment line is not where they want to be. They may think HCR is super important but not as important as their careers. I think you are taking your zeal to be above journalism too far, to the point of irrelevance. The election doesn’t ‘mean’ anything? Was it predictable, then? Did you predict it would turn out this way? Careers? That’s exactly what’s wrong with Washington. The founding fathers didn’t intend for people to become career politicians–it kind of waters down the whole notion of civil service and makes the pols short-sighted.